← Late lunch tortilla – with some green in it this time! 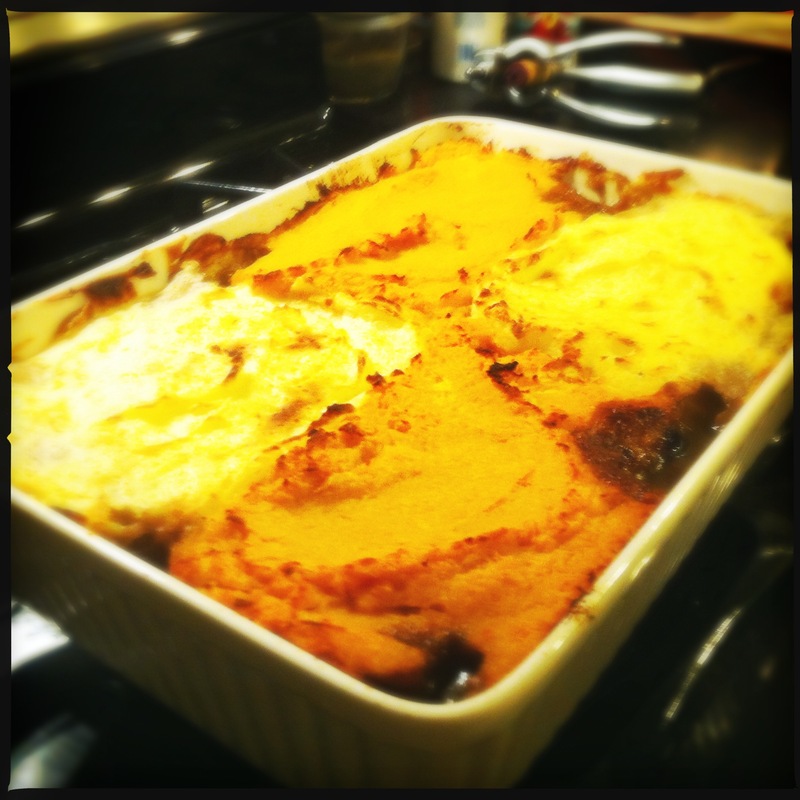 So who knew that when I decided to make this variation on shepard’s pie it would be in the 80’s?! Bad timing. 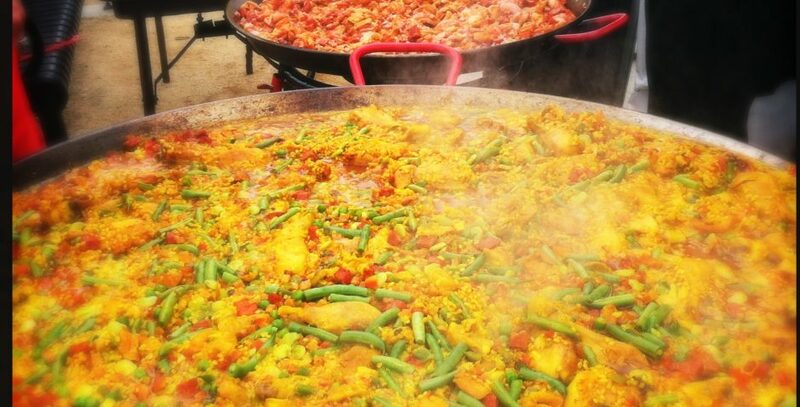 And to top it off the next weekend it was cold, wet, rainy…perfect for comfort food like this! I was determined to make this though, especially before the pumpkins went bad. I called up the friends and got started cooking. It was going to be an early Sunday super dinner, complete with comfort food and friends! With all the doors and windows open, the fans going, and shorts and t-shirts as the dress code. So, side note – most folks who have had this before have it with ground beef. As I learned from my Irish friend, technically with beef it is known as “Cottage Pie”. Who knew? Well, he did. And now I do. And you do. So to recap: lamb = shepard’s pie; beef = cottage pie. He also said something about the pie being made from whatever was leftover from the big Sunday roast and it last all week or something like that. I didn’t buy it though. Who could make something as delicious as this last all week?!?! Next up – the lamb! What a treat, lamb. I got a boneless leg-of-lamb roast at Fresh and Easy and trimmed it up and cut it up into bite sized pieces. It browned it up in my favorite pot and was off to shepard’s pie heaven. 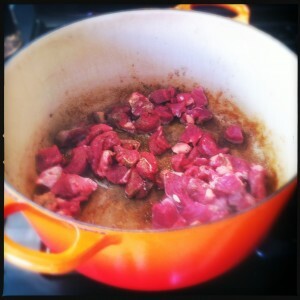 Browning the lamb meat, in batches of course so it could brown right. Make a little gravy with some red wine and get it all into a nice casserole, and start top it off with the mashed and roasted pumpkin. Wait. Wait…we have a problem here. Not everyone invited is into pumpkin. Crazy huh?! 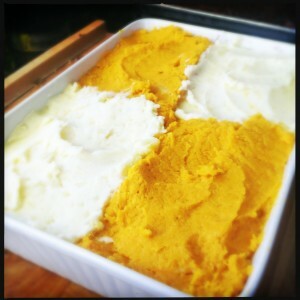 So I acquiesced and split the difference – pumpkin and potato topping it would be. Meat and veg, ready to go! Potato and pumpkin on top, ready to go into the oven! 1. Preheat oven to 400° with a rack in top third of oven. Put pumpkin on a greased rimmed baking sheet. 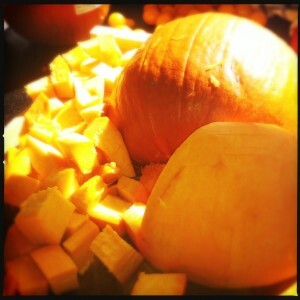 Roast pumpkin, covered, until tender when pierced with a fork, 20 to 25 minutes. 2. Meanwhile, heat oil in a large, wide pot over high heat. 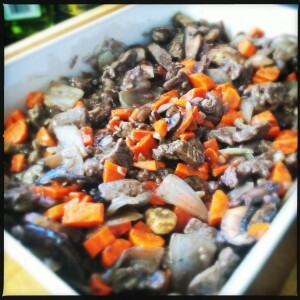 Add lamb, 1 tsp. salt, and the pepper. Cook, stirring as needed, until meat is browned on all sides. Add onion and garlic and cook until vegetables are starting to soften, about 3 minutes. 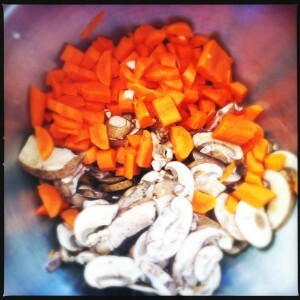 Transfer lamb mixture with juices to a bowl; add carrots and mushrooms. 3. Reduce heat to medium-low. Add flour to same pot and cook, whisking constantly, until flour smells toasted, about 1 minute. Pour in wine and broth and simmer, stirring frequently, until thickened, about 4 minutes. Pour over lamb mixture, stirring to combine. Spoon mixture into 6 individual ramekins. 4. Mash pumpkin in a bowl with remaining 1 tsp. salt and 1/3 cup cream, adding more cream if needed until mixture is consistency of mashed potatoes. Dollop over lamb. 5. Bake until browned and sauce is bubbling, about 30 minutes. Let sit 10 minutes; sprinkle with parsley. Make ahead: Complete through step 4, then chill, covered, up to 2 days. Bake 55 minutes. Looks delicious! I especially like the pumpkin/potato compromise!